When the 2020 BMW 7 Series showed itself to the world, you probably thought it looked a little like your childhood dog that never stopped sniffing you before realizing that was a little mean. But you couldn’t shake the feeling that it was just a little too, uh, nosy, and for good reason. Its grille is 40 percent larger. No, that wasn’t supposed to say 4.0 percent. The 7 Series’ grille grew by 40 (forty) percent, as if it were compensating for something. The 2020 7 Series’ new look debuted this week, along with a lineup that consists of six-, eight- and 12-cylinder engines as well as a plug-in hybrid. The cars will have eight-speed automatic transmissions when they launch onto the market in April, according to a BMW press release, and pricing won’t come out until later. Like any 7 Series, we expect it to have plenty of power and resplendent luxury. 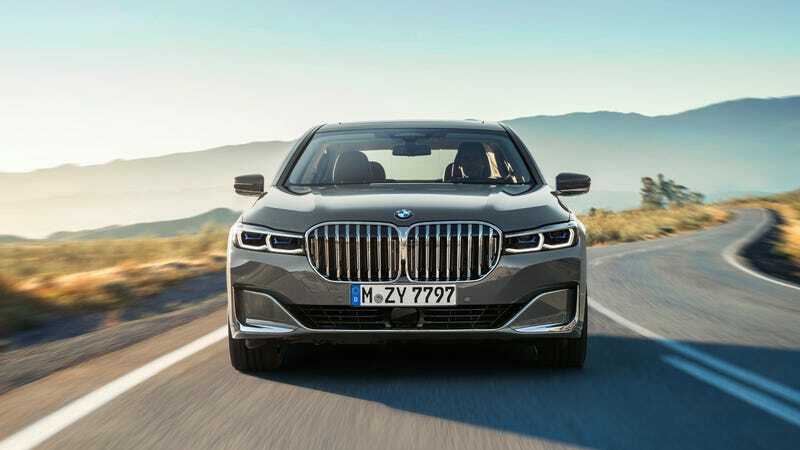 But the best part of the release was that BMW came out and owned its grille enlargement right there in the announcement of the car, saying its surface area has grown by 40 percent. Grilles, particularly big ones, have become a way to communicate luxury and exclusiveness in auto design, as we’ve seen with many, many, many brands. But they’re mostly for looks, and, when fake grille pieces are removed from modern cars to show the actually functional parts, they look pretty darn weird. There’s also a point when it becomes too much, like when you can zoom into a photo and clearly see that a grille has just been placed on top of the existing car. Since this whole “10-year photo challenge” comparing photos of oneself from 2009 and 2019 is a thing on social media right now, let’s look back at the past decade or so of the 7 Series to see how big its nostrils have gotten. It’ll be fun. If the 7 Series had Facebook friends, half of them would comment “What a transformation!” while the other half would say that something seems so different, but they can’t put their finger on what. Someone else might tell the car to stop growing up for a second and smell the roses, especially given its newfound sniffing power. Anyway, if you do end up buying the 7 Series, we hope it brings fond memories of your nosy childhood dog. Let us know if it responds to whistles or treats.